Beautifully engraved certificate from Point.com. This historic document has an ornate border around it and has the hand signatures of the Company’s President ( Court Lorenzini ) and Secretary ( Craig Sherman ). Founded in October 1995, Point.com was a brand in the telecommunications e-commerce category. Since its launch, Point.com had helped nearly 5 million consumers by providing the most effective means to compare and buy wireless phones, service plans and accessories. The company’s new business-to-business strategy and Powered by Point private-label program allows clients to market and sell telecommunications products and services online. Point.com had been recognized as one of the most comprehensive sources of wireless information by Newsweek, The Wall Street Journal, The New York Times, Business Week, Fortune, Smart Money, USA Today and MSNBC. The privately held company employs 114 at its headquarters near Seattle, Wash.
Corporate history Formerly Wireless Dimension online shopping service and Nth Dimension Corporation, Point.com was formed in October 1995 by CEO Court Lorenzini, formerly with Cisco Systems, and co-founder Doug DeSantis, formerly with Microsoft. 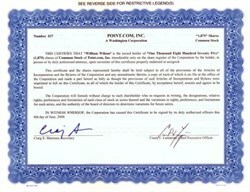 In May 1999, the privately held company changed its corporate identity to Point.com.